I believe the world is overall a good place, filled with generally good people. Still there’ve been a few times in my travels in foreign lands (and life at home) when I got myself in a situation where I thought afterwards ‘that was stupid’. This is the second post in a series about my time in Korea (you can check out the first one if you missed it). And going to Korea is not the situation I’m referring to. I’ll let you try to guess what part of this tale about my first few days in Korea I am referring to. BTW, Mom and Dad, there might be things in these posts that you didn’t hear about at the time because, well, everything ended fine so why worry you after the fact? To set the stage, despite being a vegetarian for a few years at that point, I decided that I’d eat meat in Korean dishes. So, on the flight over, I went all in on Korea, and get the Korean meal, even though I hadn’t eaten meat for the few years prior and had never had kimchi (amazing to think that I make it now — I need to write a post about that). Needless to say, that was probably a mistake. My stomach was not impressed. When I arrived in Korea after a 17 hour trip across the Pacific (on what was, I think, my second trip outside Canada, minus trips to the US), I was tired, discombobulated and had an upset stomach. I had arranged to meet the manager of the hogwan (language teaching academy) at a hotel on the other side of Seoul. Probably another mistake, especially since my flight was late. Thought, to be fair, there was a bus that went right there. But, when I got off the plane, I couldn’t read a thing (or so it seemed at the time). And I couldn’t figure out how to use the phones. I stumbled over to what looked like an info counter and asked for directions, and I kept about half of them in my head. I found the bus, and bought a ticket, and took my seat, and started the trek across Seoul, realizing pretty quickly that I didn’t know how I would know when to get off. Luckily, a businessman (and family man, just in case you’re thinking he had ulterior motives) who spoke good English was in the seat beside me, and struck up a conversation. He not only gave me detailed instructions on how to get where I was going, but gave me his business card if I needed anything. He also made a point of showing me the lit bridges as we crossed over the Han River, at beautiful sight even to my bleary eyes. I did eventually make my way to the (very swank) hotel, where I found not only the manager but the owners, who I’m pretty sure I was supposed to impress. I was too tired and discombobulated to be impressive. But they felt the need to feed me (don’t be lulled into a false sense of security, more on them in future posts) and paid a pretty penny to buy me a seat at the buffet where I hardly ate a thing. Eventually they gave up trying to feed me, for which my upset stomach was thankful, and drove me to my apartment. There was apparently supposed to be another teacher there, who would show me around…we’ll call her Mel. She wasn’t there, but that’s fine since I wasn’t feeling very social. The next day I woke up and realized that I should call my parents. Umm, I didn’t have a phone. The apartment didn’t have a phone. Bugger, I’d need to figure out how to use the Korean pay phones. Luckily there were pay phones, though I don’t remember if I actually succeeded in getting in touch with them that first day. Other than that, my first day involved wandering the area while trying to make sure I was still able to find the apartment again. Mel showed up about supper time the second day, and took me along…to KFC. I caved pretty quickly on the idea of only eating meat in Korean dishes. Then she asked: Do you want to go to Itaewon with me? To which, I said: Sure, better than sitting on the kitchen floor all night (since the light in my bedroom is broken) trying to read or write about what a mistake this was. Okay, that last part might have been in my head. Sure, I said. I’d already read about Itaewon, but for the rest of you, Itaewon was ‘foreign’ district. Which basically meant it was full of drunk foreigners on Saturday nights. Aside: Itaewon didn’t make a great first impression, but it would become a love-hate relationship over my time in Korea — besides being full of drunk foreigners, it was also full of shops with clothes in sizes that fit and the black market store with products from the US Military Exchange (including tampons, which at the time were hard to come by). 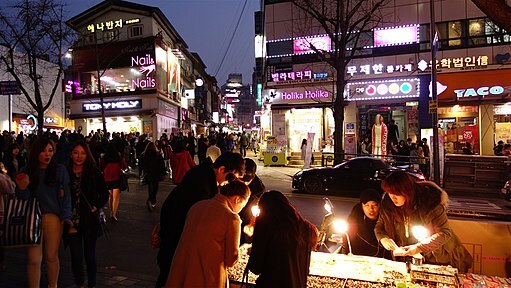 The pic down below is NOT Itaewon — it’s Hongae — but it gives you an idea. I was still a little jet-lagged and not really feeling the “getting drunk with strangers” thing. After a couple of drinks, feeling slightly buzzed and very tired, I decided I wanted to go home, so Mel helped me get a cab. Seoul had an awesome subway system…until it closed at 11PM. Seriously, 11PM? Maybe that’s changed. She gave the driver a slip of paper with our address on it, because good luck if I knew where I lived. There were a couple of times on that drive through the vastness of Seoul that the driver had to stop and make a call. Did I mention I didn’t have a phone? It was actually in Korea that I discovered the joys of cell phones. But you know what, the driver wasn’t calling to find out which ditch he should leave me it. He was calling to find out where the frik the apartment was. After a couple of calls, he got me safely home. I think he even watched to make sure I made it down the dark laneway and into the building safely. The next day involved a fruitless search for the special garbage bags in order to dispose of your waste without having a nosy Nelly hiss at you (they exist the world over) and a more successful search for a department store, where I picked up bread and peanut butter (my diet for the first week, until I found out how to actually get into the rumoured grocery store in the basement of Technomart — a technology-focused tower mall near me). The next day after that was Monday, when I started teaching at the hogwan…but this post is already long, so I’ll leave that tale for another day. It’s interesting reading over journal entries from those first few days in Seoul. I was apparently unhappy and thought I had made a huge mistake, but that’s not what I remember — I remember it as a good story to laugh about and the start of a great adventure. I’m so, so glad that I didn’t just give up and go home based on those early days.